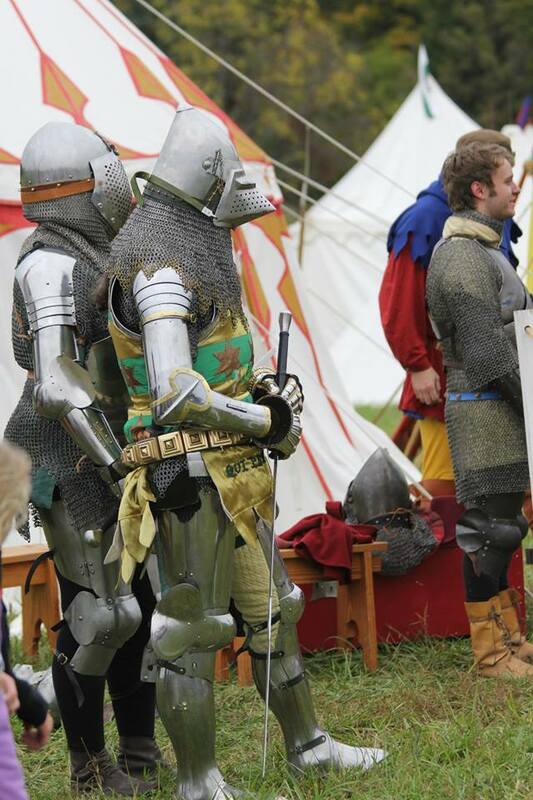 This week, I thought I’d interview another armourer. 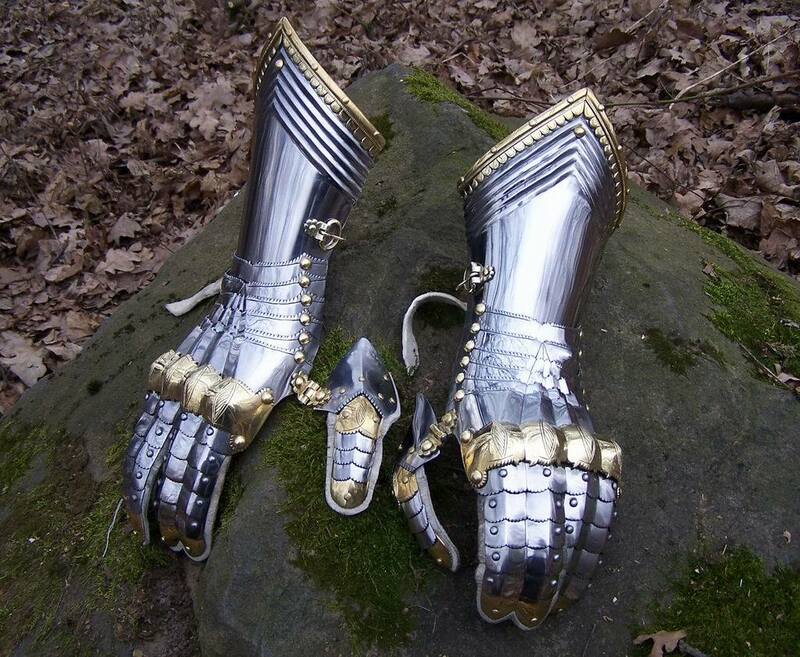 Now, perhaps you are all bored by armour, but to me, it is the most complicated costume artifact ever. Let me put this in perspective as a writer. I wear armour 20-30 times a year, and almost every time I wear it, I learn something—something about fit, perhaps, or fatigue avoidance, or maybe just a better way to lace the plates to my arming coat, or a better place to put my hands. This process has slowed, but it never stops, and the process itself has a sort of meta-learning—I now have an ever-better notion of how much training it required for a knight to be able to wear, and maintain his harness. And how long it takes to put it on or get it off. 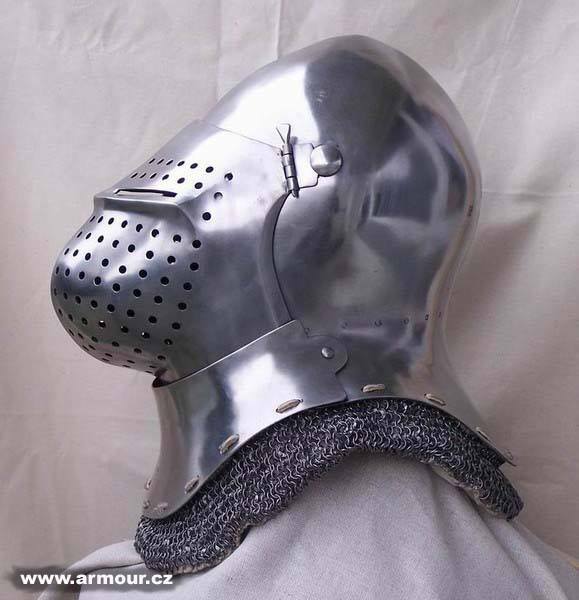 There’s a piece out there in Youtube land about how hard it is to wear armour, and some researchers at the University of Leeds put out an article too. And their findings vary between the banal (wearing armour makes you tired) and the slightly absurd—the French lost Azincourt because they were wearing armour… hmmm. The truth—at least according to me—is that wearing armour is a skill. I hope that any volunteers in studies have the skill. And that fit matters terribly—incredibly—so that as knight in perfectly fitted legs has an incredible advantage on foot against a knight whose leg armour pinches. Add to this a matter of fitness—I find that every single effort I make towards personal fitness is rewarded in harness. Every pound of weight I take off is less I’m carrying—because I’m carrying 90 pounds of plate and chain, that’s why. All the rope-skipping and jumping jacks and running—is required for my legs. Wow, you want strong legs in harness. And so on. Oh, and by the way, there’s a size determinant too. A big man—like Edward III or Bad Tom—has more muscle carrying his armour. There is a definite power-weight ratio—the bigger man’s bigger armour isn’t really much heavier, but his muscles are that much stronger, and thus, he’ll fight longer. In armour, ‘to the big it is given.’ Size does matter. 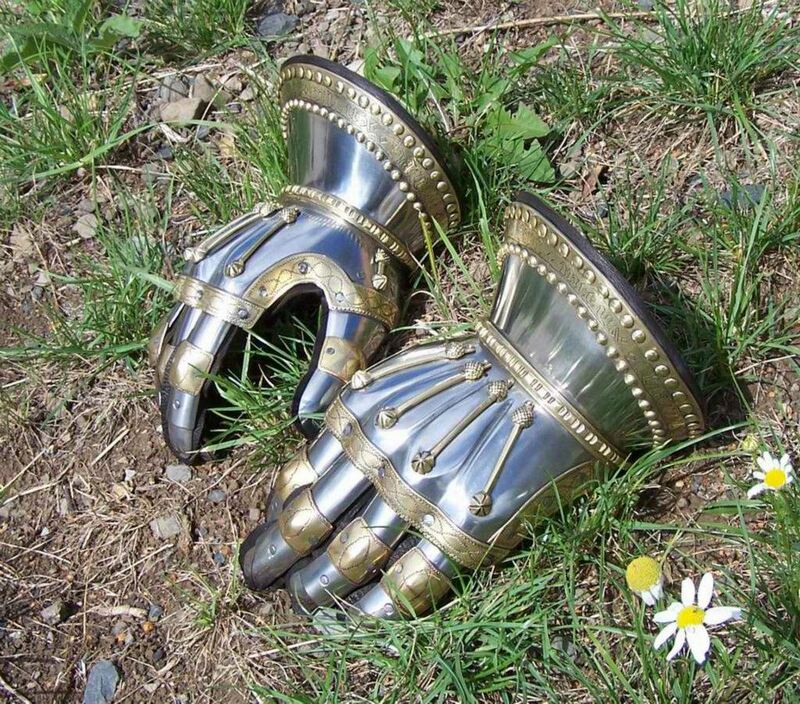 My gauntlets. Oh, and the Captain’s, too. Hardened steel, my motto (Geoffrey de Charny’s) engraved on the cuff band. Light as air, strong as faith. That is to say, he has made the most important part of the harness in which I fight, except the helmet. To my mind, he is the most aesthetically talented medieval armourer in the world, and perhaps the best overall, although I’m probably not the right man to judge, and Robert Macpherson, Craig Sitch and half a dozen others (like Jeffrey Hildebrandt) might well deserve that honour. (And I like all their stuff, too. Mac made my first harness and Craig made most of my Greek stuff. They’re both brilliant). As an aside–who’s the best? It’s like books and sports teams. A lot of beauty is int he eye of the beholder. Because I couldn’t stand in Jiri’s shop and annoy him all day as I did with Jeffrey Hildebrandt, I chose to interview him. I thought all of you might be interested in what a master armourer had to say about his craft and his work. The man himself, in his shop. 1) How did you become an armourer? 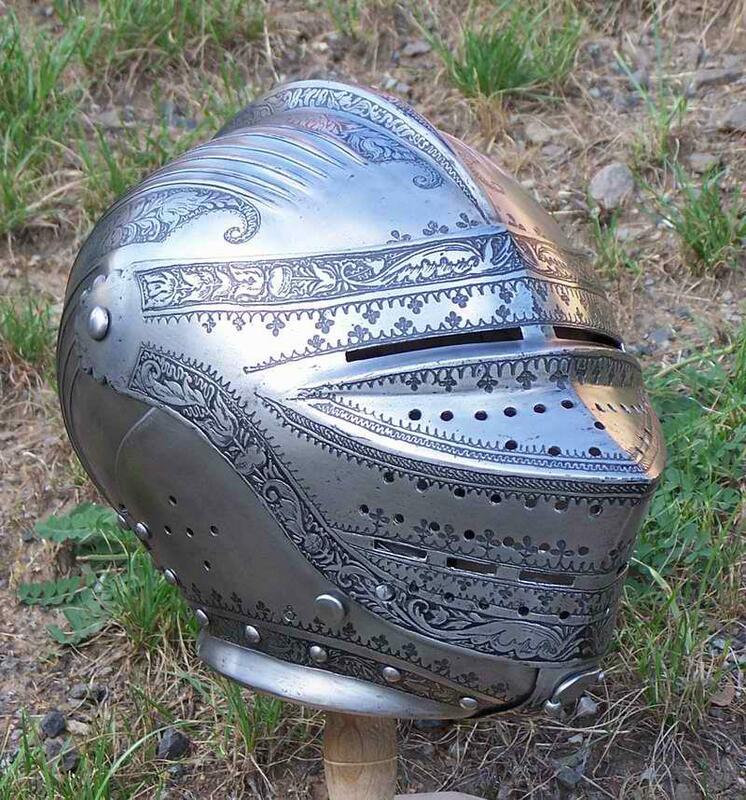 1a) I became an armourer due to the lack of money and expensive taste for armour for my own use. After some time I realized I liked the production of armour itself. More than using it actually. 2) What formal training did you have? 2a) No formal training, 20 years in trial and error school. I have a bachelor degree in economics. 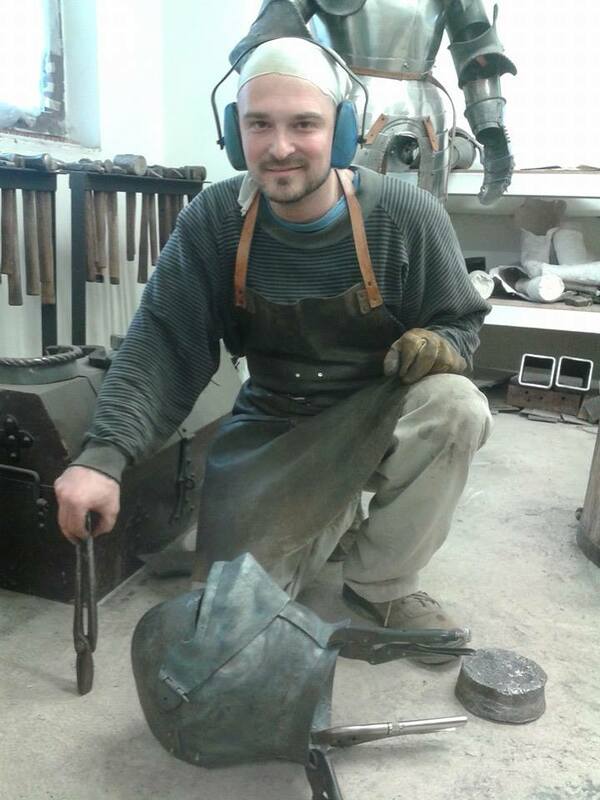 I have read a good number of books armour smithing, sheet metal working and art. I spent literally years watching original pieces of armour. I have seen many great craftsmen of various crafts working. And realized that it is not much about the hands but mind to make your working process effective and also about seeing the piece already finished in your head. No matter if this is armour or a table. 3) What did you have to teach yourself? 4) What part do you love best? 5) What part do you hate? 4a and 5a)I usually struggle with the current project and looking forward the next one It is not about what I do, but how. I don t prefer any particular part. 6) What time period, if any, is your favorite? Is this artistic, stylistic, or practical? 6a) I like mostly real fighting stuff pieces, mid 16th German and mid-15th Italian. For its simple lines that look pretty easy to do, but are very hard to reproduce properly. I like rough pieces made by craftsmen who knew what they do. You can see they were trained well by their teachers and trained in one particular style of armour only. 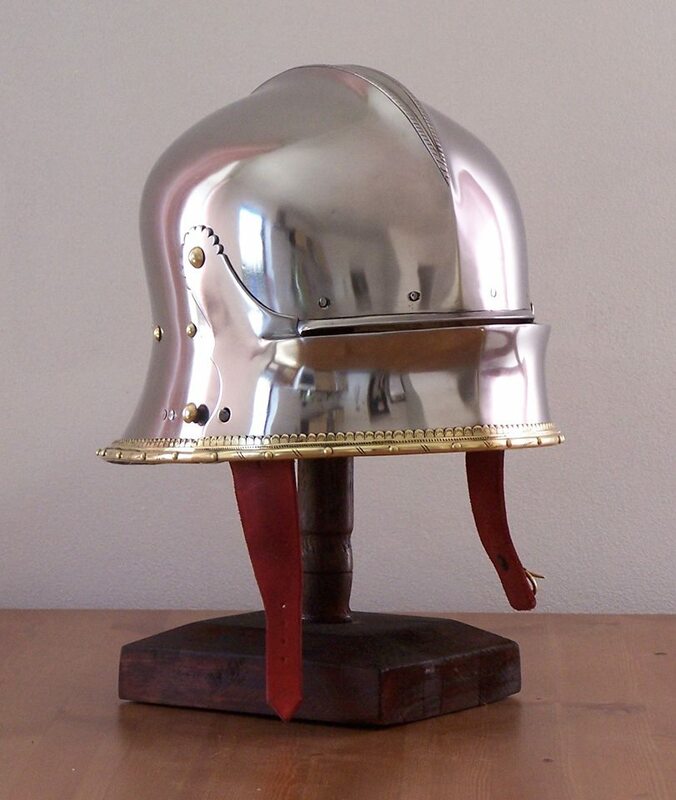 We are much more distracted today, making conical helmet one day, Milanese BP other day and cuirassier next day. 7) Do you wear harness yourself? 8) What is one thing you’d like a first time customer to know? 9) What is one thing you wish all customers did? 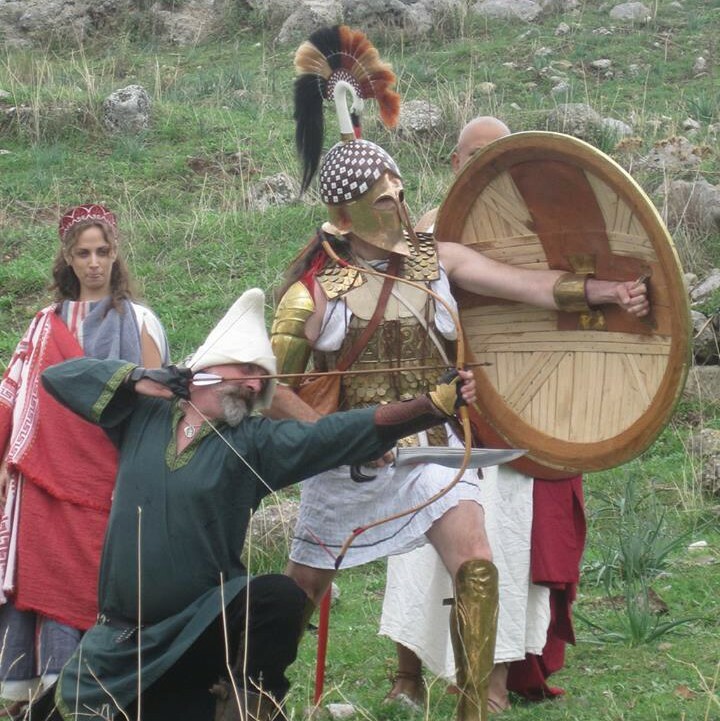 9a) shape themselves into the body form matching the armour style they are about to have built. It is often very painful to compromise function and aesthetics. 10) Anything you’d like to say? Anything at all. Politics? craftsmanship? 10a) I am not very much a man of words, especially in English. Also my politic opinions should not be connected to the craft. 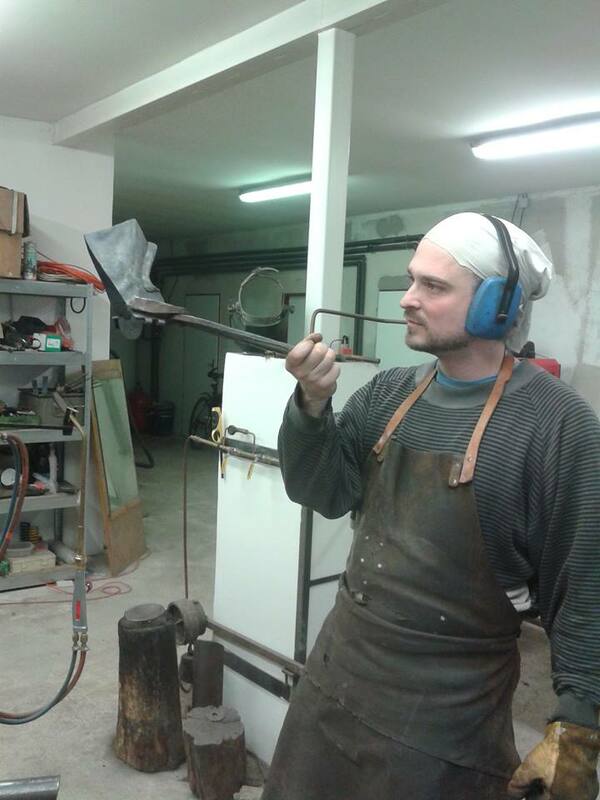 I might say that I wish everyone being as happy in their professional life as I am as an armourer. Hard work, but lot of self-realization. His prices are quite reasonable. His wait time is long–he is currently looking at November 2016–like all the good armourers out there. Want something perfect? Get it from a master. And wear it for the rest of your life. But be patient. One of the things I like best about Jiri is his honesty. He will update you on his progress on your project–or tell you about his failure or his delay. I love this. But the customer bears half this responsibility. Don’t nag. Be aware that this is master-craftsmanship, and that replicating the great art and technology of the past is not a matter of programming to fine tolerances. It is a matter of art and patience and even a little good fortune. Give your craftspeople the time, and they will do great things. 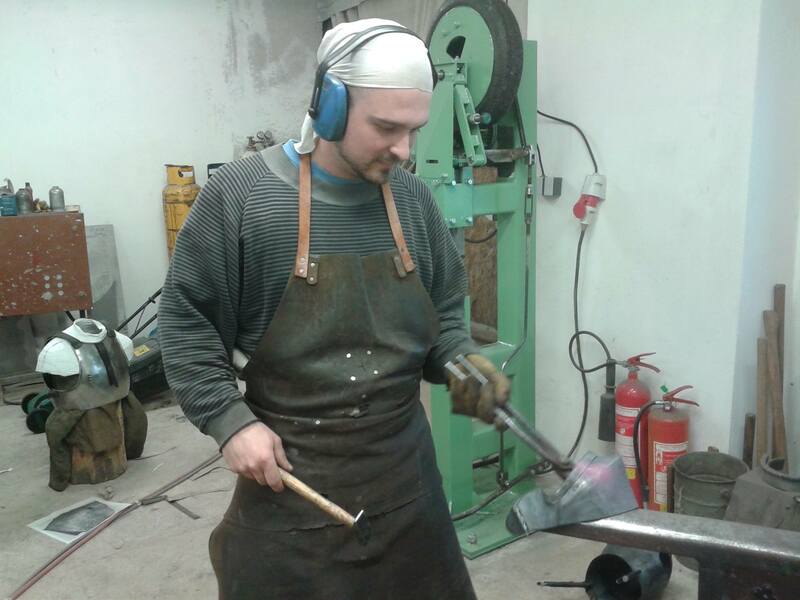 Want to see Jiri working? An old Czech TV spot. Next up–a few words on magic. I seem to be regular re-blogger of Christian’s blog posts, but they are so damn good. and the people he knows are true masters of their art.